Where does the time go? When I signed up last month for Carl’s group read of The Graveyard Book I knew on October 10th he planned on holding an event in conjunction with the group read. He wanted us to post anything as long as it pertained to graveyards. I thought about doing something clever since I’ve been to a few graveyards in the States and England. Yet, time slipped away and today is the 10th and I’ve got nothing. I did snap a couple of photos during my walk this past Monday. For other entries, please visit this page. This entry was posted in Random and tagged 50 Year Project, Brompton Cemetery, Cemeteries, Life, London, Neil Gaiman, Photography, Photos, RIP, The Graveyard Book. Bookmark the permalink. 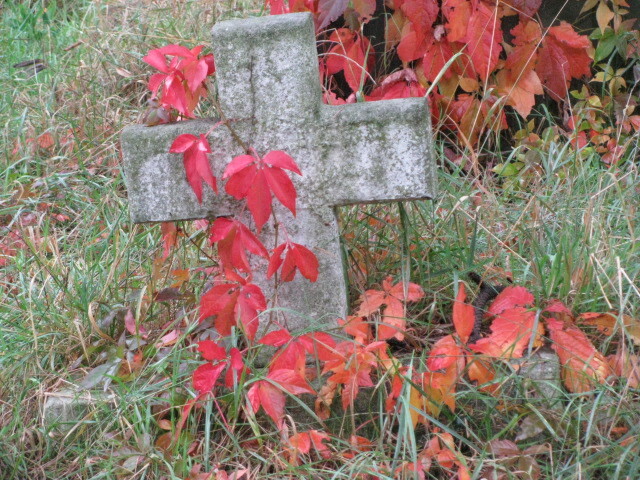 I like the fall color leaves over the tombstones. Now *that* is an interestingly overgrown graveyard. I like it. Its the kind of place I would walk past and my curiosity would get the better of me and I’d find myself whisked off through a ghoul gate. Ha…since reading about the ghoul gates I’ve been keeping my eyes open for one. If you are ever in the area I’ll show you around this cemetery. I have a map of all the famous residents and I have a few spots that I love to visit. I feel like they are hugging the gravestones…like a loved one. The colors are so soft. They blend well with the background. I love the colors, but it looks sad all over-grown like that. It can be sad. And I hate seeing that some of the tombstones have cracked and need repair. I knew you would have some beautiful photos to share for this. I love the colours and strangely, I hope this isn’t too weird, but I sort of like the over-grown look – although I can see why it makes it a bit sad and forlorn. From what I know, they can only maintain 1/4 of the cemetery at a time (budget reasons) so some parts are trimmed and others are overgrown. Dogs are only allowed in the overgrown sections, which works for me. I find it lovely in a way. and Miles likes the little trail. Except last spring the bushes were really tall and he became afraid when there was a bend. he’d slow down and look to see if the coast was clear. It made me giggle. i am with carl, just cant keep out of those old graveyards …the interesting ones with foliage! I love those brilliant red leaves. They look so bright and alive–even though really, they’re changing color because they’re on the way to dying too. I feel like there’s a metaphor or symbolism or something in there somewhere…I’m not quite clever enough to tease it out! It is such a beautiful place to walk through. I look forward each day to meandering through here with Miles. I bet Miles does too. Oh he does. He hates going out in the morning–he’s not a morning dog. On most mornings he doesn’t get out of bed until an hour or so after me. But in the afternoon, he’s ready to go and explore. And stick his nose in all the smelly stuff he can find. I find myself stopping a lot on my walks to take in the colors. Fabulous images… love the colors and contrast that the bright leaves provide. I have a bunch of great graveyard photos from years past, but like you- time slipped away and I never did get to unearthing them! Hi, stumbled upon your blog and really like it. Am wondering why Carl wants graveyard posts on the date you mentioned. I’d pick All Saints. Or will he be in Transylvania that day? Transylvania! That always sends shivers down my spine. Boy, this brought out the comments didn’t it? I love graveyards. I often stop and stroll through an interesting one if I am traveling. I even worked at an office at a Perpetual Care Cemetery for a couple of years. I love visiting graveyards during my travels. You can learn so much about a place and the people. New Orleans has one of the most original–at least so far. 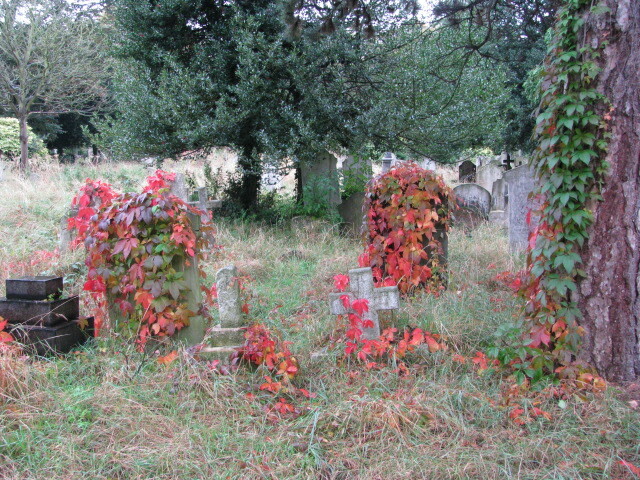 Those are colorful tombstones with the autumn leaves. Nice shots!